UniPlace is pleased to announce a new field study program with the University of Illinois. Over the course of a semester, students from the University of Illinois have the opportunity to do field study work with the UniPlace community dinner and UniPlace outreach programs for class credit. 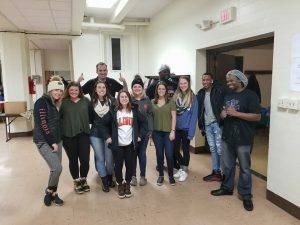 In the UniPlace field study program, students have the opportunity to interact with our community dinner and food pantry programs while they learn about the social issues relating to hunger, poverty, and other social injustices. In the UniPlace Field Study program, students also have the opportunity to network and meet other community leaders in Champaign-Urbana and identify ways to address on-going social injustices while gaining hands-on experience and mentorship that will help them in the field of social work, education, and non-profit community leadership when they graduate. Community Dinner – Students will have the opportunity to work with the community dinner program, interact with community dinner guests, and learn about the social injustices in our world and community relating to hunger and housing insecurities. They will also have the opportunity to create and lead a project relating to addressing hunger insecurities in our community. Food Pantry – Students will have the opportunity to work with the food pantry program, interact with the food pantry participants, and learn about the social injustices in our world and community relating to hunger and housing insecurities. They will also have the opportunity to create and lead a project relating to addressing hunger insecurities in our community. Community Partners & Projects – Students will have the opportunity to reach out to the Champaign-Urbana Community and learn about the social issues facing our community. They will work with different community partners that work with underserved populations in our area and will have the opportunity to create and lead a project relating to addressing hunger insecurities in our community. Since the program began in the fall of 2017, students from the College of Social Work 461 and College of Education 201 had the opportunity to do field study work at UniPlace. Enrolled in one of these classes? Talk to your professor about doing field study work at UniPlace! To participate in the program, students must be enrolled in an education program (college, high school, or vocational training) and assigned to receive a certain amount of credit hours. Hours of the program for students average around 3 hours a week and are allowed to be adjusted pending on course requirements.